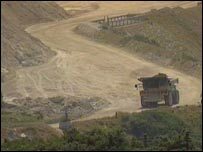 Parliament is to debate demands for government help following plans to cut 800 china clay industry jobs in Devon and Cornwall. Truro and St Austell Lib Dem MP Matthew Taylor requested the adjournment debate, which takes place next Tuesday. He will call for intervention similar to that given to MG Rover after its 2005 collapse, his office said. The Department of Trade and Industry said there would be no financial help, but staff would have retraining advice. Mr Taylor's office said government intervention was needed "to make sure that the wider community doesn't go to pot". Imerys announced plans to cut the jobs - more than 700 in Cornwall and up to 85 in Devon - on Monday. It blamed high energy prices, a weak dollar and strong overseas competition for significant business losses. Mr Taylor's office pointed out former Trade and Industry Secretary Patricia Hewitt handed over £6.5m to support MG Rover during sale negotiations in early 2005. MG Rover was eventually bought from the administrators by Chinese carmaker Nanjing Automotive. The Devon and Cornwall Business Council has called for a task force to help workers because, it says, the local job market cannot absorb such a high level of redundancies.